The chapter starts exactly were the past left off. The Stride Gate has been opened and Chrono, Shion, Tokoha,Taiyou and Am are chosen as the Arbiters who will take part in the Judgment! Meanwhile the area that is being covered by the Stride Gate´s light it´s getting bigger and bigger, and everyone who is trapped by it enters in the “Perfect Future” of Ryuzu. Our Heroes calls Chris, who is in a far location, so he isn´t captured by the light of the Stride Gate, he explains , to put it short, that every person inside the Stride Gate is transported to an imaginary ideal world of it´s own; those imaginary worlds, and the one who sustains it, is moved by the Stride Gate, who is feeded by the energy of Cray, and by such is killing that Planet, at the same time Ryuzu, who is an administrator, he is basically a god and is able to eliminate or delete any imaginary world who either doesn´t align with his philosophy or has sparks of rebellion…Huh, sounds like what some people with certain political thinking want to do, no? In any case, the Stride Gate area has reached were Chris is and now he is unable to help them more. Meanwhile we get to know that Ibuki didn´t fell Asleep, even though he is not an Arbiter, since as Ryuzu said in the past, he is just someone who stock up his noose where he didn´t belong. In any case Ibuki is going where Ryuzu is. There it is to say that such fact was done thanks to Shouma, who excluded Ibuki to be part of such things when he messed with Wakamizu´s machine. A Fight between these 2 powerful warriors is about to begin! Back with Chrono and the others; they are able to see the first turns of such match between Ibuki and Ryuzu, it seems that the fights are real in this space where both worlds cross over. Now all of them are going together in order to defeat Company and save everyone! Luna and Ibuki! No men behind! Everyone enters to the Stride Gate and are divided; Chrono appears in a structure made of destroyed Gears; Shion in some temple stairs; Tokoha in front of Enishi where either nature and gothic stuff are seen floating around; Am in a wrecked ship near Luna; finally Taiyou appears in front of Hiroki. Chruch Bells are heard, a judgment fight is going to start! Hiroki Vs. Taiyou; Tokoha Vs Enishi; Am Vs. Luna! Shion soon enough finds Shouma (he also finds his family sword BTW), a fight between these 2 enemies is going to begin too! Back to the fight between Hiroki and Taiyou. 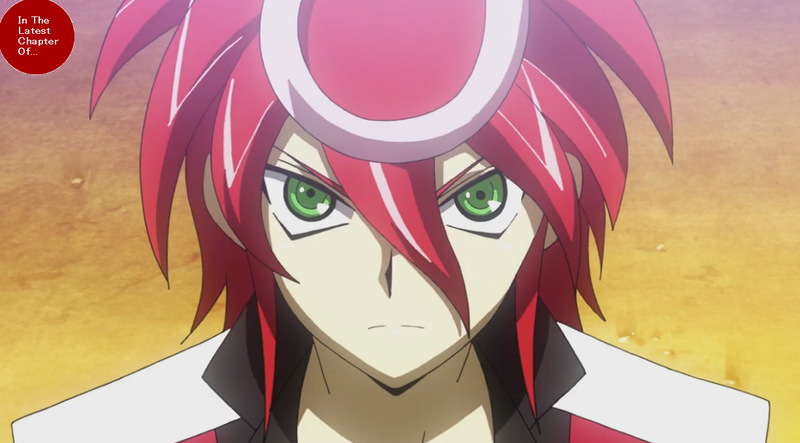 Taiyou has brought his G4 Card and starts using some good moves that fills his field and Taiyou Attacks! His first attack is against a rearguard; which Hiroki let it pass because he doesn´t care for such things, now Taiyou attacks with his Vanguard! In the drive checks he gets a Critical trigger! Still Hiroki survives the turn! Taiyou Asks if Hioki in truth believes in that “perfect Future” which Hiroki replies with an affirmative, since he is part of Company too. Now It´s Hiroki´s turn and he brings hi G4 Card X-Gallop! Hiroki starts telling his perfect world! One where the villains are non existent; but not only them, also the ones who doesn´t help or serve Justice are eliminated too! Hiroki starts giving his units more and more power like a madman! Hiroki attacks; but Taiyou blocks with a perfect guard! Taiyou asks againg if that imaginary world it´s what he truly wants? Still Taiyou blocks all of the attacks!. In that moment Taiyou understood one thing: That if those harsh times haven´t ever existed he wouldn´t be like he is right now, he wouldn´t have opened the doors to a new future for himself, he wouldn´t be Taiyou! Taiyou brings his G4 Card! He starts filling his field and powering up his units! Hiroki is now afraid of Taiyou´s resolution, on how Taiyou was basically the same as him! Taoyou says that Vanguard is all about bonds! Taiyou attacks! Suddenly…Hiroki is in front of Taiyou. A Very good chapter! I had bigger expectations though, since this chapter in the passing was truly fast! Felt like 3 chapters crammed into one. Still it was enjoyable nonetheless! Now while the fight between Hiroki and Taiyou wasn´t as cool as the past time they fought each other, still it was good enough and I liked how they developed both characters in the last part of the fight! A truly emotional roller coaster for both youngsters, don´t you think? Especially because it was well handed such emotional moments. Anyway, I am hyped for the upcoming fights of Tokoha, Shion, Am and obviously Chrono! Anyway that´s my two cents, so see ya next time!